Cheer Boys!! : The Complete Series - BUY THIS BLU-RAY! 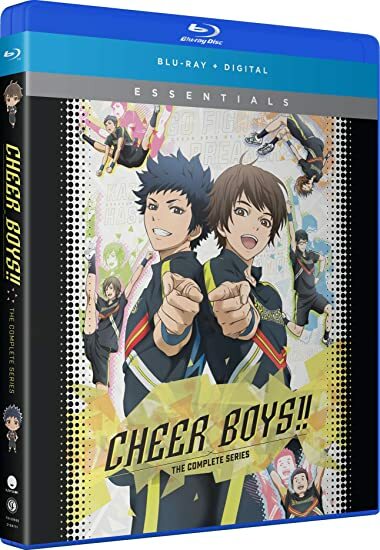 Inspired by a real all-male cheer squad in Japan, Cheer Boys gives the world an exciting new take on the high-flying team sport! Overshadowed by his older sister, Haruki Bando leaves judo martial arts in search of a sport where his talents can shine through. But when his friend Kazuma comes to him with an idea, no one would have guessed he would turn to cheerleading! Rocking the college campus with a killer routine, these amateurs manage to draw in a crowd and enough new members to compete in regionals. While they train day and night, complicated lifts aren't the only things they have to balance. Between work, life, relationships, and practice, these 16 men will push each other to the limits for a team that will break through the cheerleading scene. THEN SEND IN A COMMENT ABOUT YOUR FAVORITE FUNIMATION TITLE (you may click on artwork above for a refresher) PLUS YOUR NAME AND ADDRESS TO contests@efilmcritic.com or WeLoveHBS@aol.com. (Just one e-mail please.) Put [b]"CHEER BOYS, CHEER ON THOSE WOMEN!" in the subject line and cross your fingers. We will draw names and one of the prizes could be yours. Only 1 entry per household.